In a press release dated March 24, 2014, Christie’s auction house has announced the holding of its New York spring magnificent jewels sale on April 16, 2014, at its flagship Rockefeller Center salesroom. More than 250 lots will be on offer at this sale to be held in two sessions, the morning session beginning at 10.00 am, featuring lots 1 to 131 and the afternoon session beginning at 2.00 pm, featuring lots 132 to 255. 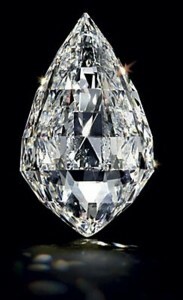 The auction includes a wide range of jewels both modern and historic, set with high-quality colored and colorless diamonds, gemstones and natural pearls, as well as two important private collections and signed jewels from renowned jewelry houses, such as René Boivin, Cartier, Tiffany & Co, Van Cleef & Arpels, JAR, Graff and Harry Winston. Christie’s expects to achieve a total sale of more than $50 million at this auction. The private collections are that of Riki and Jerome Shaw and Kathleen and Martin Field. The proceeds of the Riki and Jerome Shaw collection, expected to achieve over US$ 6 million will go towards animal rescue and welfare, a worthy cause organized by animal rights activisit Riki Shaw in her continued fight against animal cruelty. 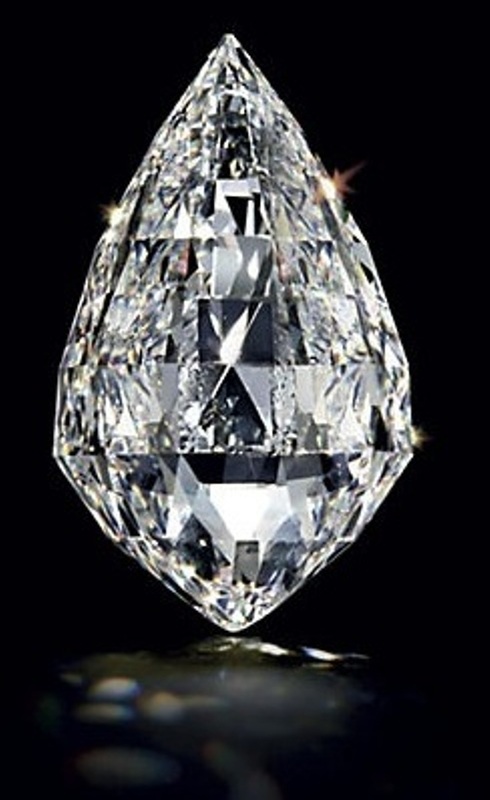 Exceptional diamonds, both colored and colorless, consistently broke auction records at various Christie’s and Sotheby’s auctions held in the year 2013. It is widely anticipated that this trend will continue into year 2014 too, and Christie’s April 16 auctions has an impressive lineup of lots incorporating top-quality diamonds. The top lot at the sale is a pair of diamond ear-pendants designated as Lot 255, the last lot on offer at the sale, and characterized as a “Sensational Pair of Diamond Ear Pendants” set with a matching pair of D-color (Type IIa), internally flawless, circular-cut diamonds weighing 22.60 and 22.31 carats, and mounted in platinum, and suspended from a shield-shaped and a smaller circular-cut diamond surmounts. A pre-sale estimate of US$ 7-10 million is placed on this lot. Another important lot incorporating diamonds is Lot 227, characterized as “A Spectacular Diamond Pendant Necklace” with a pre-sale estimate of US$ 5.5-7.5 million. The necklace suspends a 50.05-carat, D-color, Type IIa, Flawless, briolette-cut diamond, with excellent polish and symmetry. Lot 131, titled An Important Colored Diamond and Diamond Ring by Harry Winston, is another top lot of the sale, with a pre-sale estimate of US$ 4-6 million. The centerpiece of the ring is a cut-cornered rectangular-cut fancy intense pink, VVS1-clarity diamond, weighing 6.10 carats, flanked on either side by a tapered baguette-cut diamond, mounted in platinum and 18k rose gold. Lot 107, described as a Spectacular Diamond Ring incorporating an oval-cut, 40.43 carat, D-color, Type IIa, VVS1-clarity diamond as its centerpiece, mounted in platinum, with a pre-sale estimate of US$ 5.8-7.8 million, is another top lot expected to perform well at the auctions. A significant lot with an ancient historical provenance due to appear at the April Christie’s auctions is Lot 225, An Historic Emerald and Diamond Brooch, by Van Cleef & Arpels, designed in 1967, but incorporating a central modified cushion-cut emerald weighing 7.77 carats, that originally adorned the diadem/tiara of Marie Louise, the second wife of Napoleion Bonaparte. The Emperor presented the diadem as part of a matching set of jewelry, made by Etienne Nitot et Fils of Paris, to his wife on the occasion of their wedding in 1810. The Empress later bestowed the set to her aunt, Archduchess Elise and subsequently, in 1953, the diadem was sold to Van Cleef & Arpels. 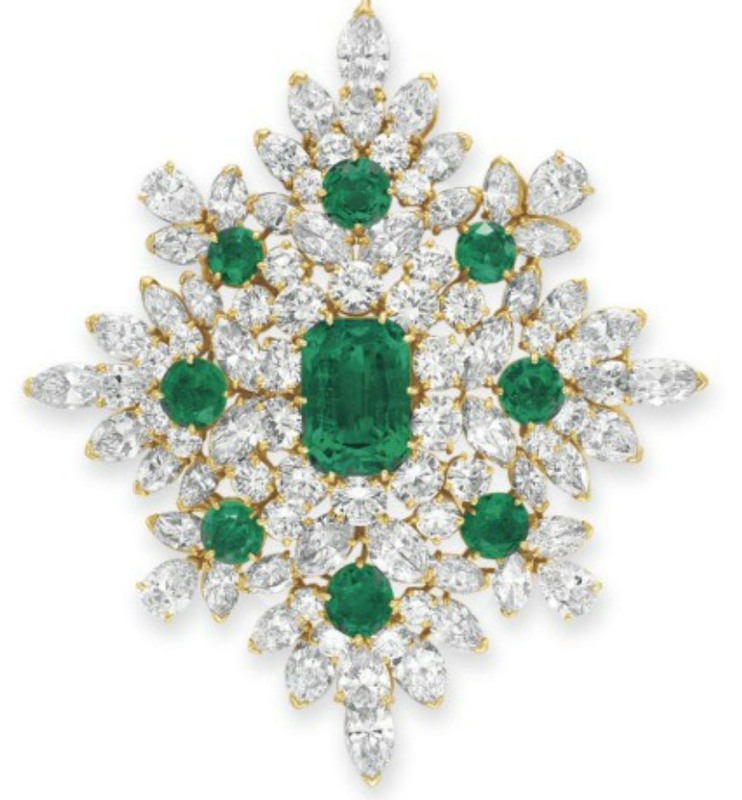 In 1967, Van Cleef & Arpels created and designed the present brooch around the central emerald of the diadem for the great American philanthropist, Mrs. Sybil Harrington. 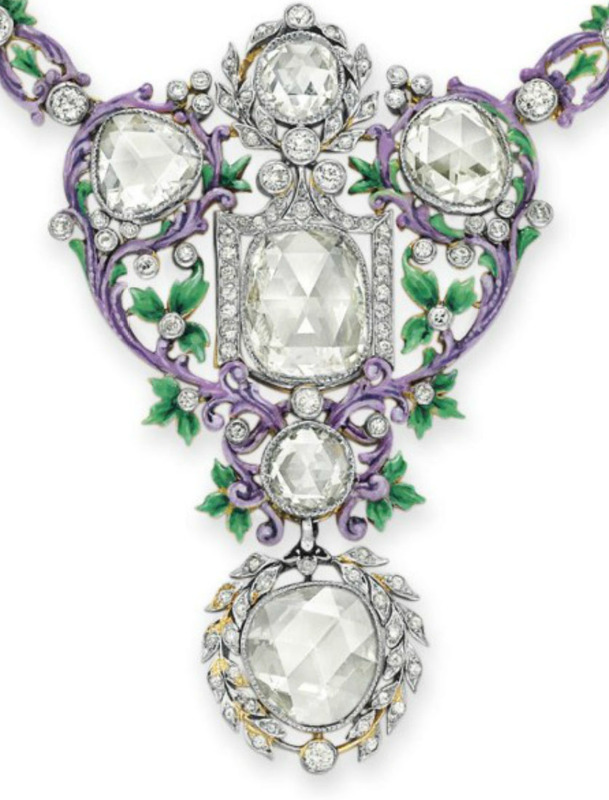 Christie’s offered the Collection of Mrs. Harrington in October of 1999 at which time this brooch sold for $178,500. Christie’s has said that it is proud to offer the brooch once again for sale, to afford a new collector the rare opportunity to carry on the legacy of this Royal jewel. Two creations by Joel Arthur Rosenthal, one of the pre-eminent jewelry designers of the world, who works in Paris under the name JAR, will also be among the highlights of the April 16, 2014 Christie’s New York auctions. 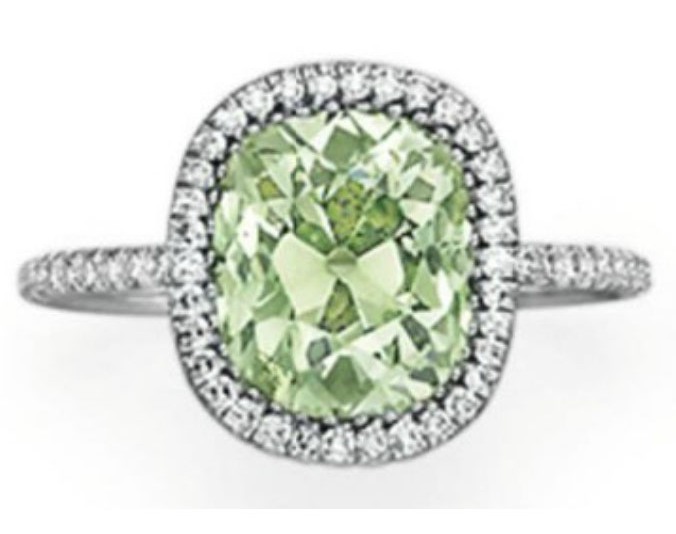 One of these – Lot 95 – is a colored diamond ring designed by Jar, set with an old-mine-cut, fancy yellowish-green diamond weighing 2.49 carats as its centerpiece, surrounded by a layer of single-cut colorless diamonds mounted in platinum. 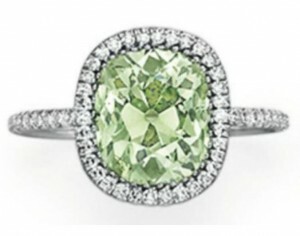 The 2.49-carat, old-mine-cut, fancy yellowish-green diamond has a historic provenance associated with it, and was first set as the centerpiece of an engagement ring for Countess Eliza given by Count Zygmunt Krasinski, one of Poland’s greatest Romantic poets, whom she married in Dresden in 1843. 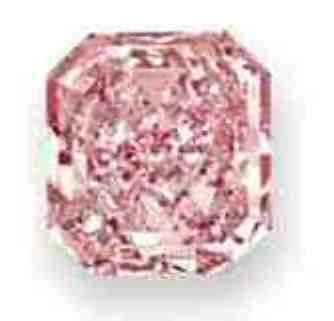 A pre-sale estimate of US$ 300,000-500,000 is placed on this colored diamond ring. The other lot by JAR is Lot 226, described as A Colored Diamond and Diamond RIng by JAR. 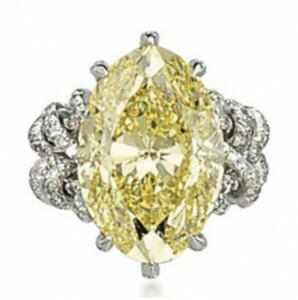 The centerpiece of this ring is an oval-cut fancy intense-yellow diamond, weighing 15.75 carats. The size 2 1/2 to 3 ring is made of twisted platinum thread/wire pave-set with small single-cut diamonds. A pre-sale estimate of US$ 500,000-700,000 is placed on this lot. Great design is the core of what makes classic jewelry hold its value over the long term, and Christie’s is honored to present the most significant examples from the major jewelry houses in each of its auctions this spring. In New York, Christie’s presents over sixty signed jewels by Suzanne Belperron, René Boivin, BVLGARI, Cartier, Tiffany & Co., Van Cleef & Arpels, David Webb, and Harry Winston, among others. One of the signed jewels by Tiffany & Co. was designed by Paulding Farnham around year 1900. This is Lot No. 117, titled A Set of Belle Epoque Diamond and Enamel Jewelry, By Paulding Farnham. The centerpiece of the necklace is designed as an openwork enamel foliate plaque, set with rose-cut diamonds and enhanced with collet-set circular-cut diamonds. The foliate link neckchain is set with collet-set old European-cut diamonds. The pair of ear pendants of matching foliate design, is also set with collet-set old European-cut diamonds. A pre-sale estimate ofUS$ 150,000-250,000 is placed on this lot. Lot 230 – An Elegant Diamond Necklace with a pre-sale estimate of US$ 450,000-650,000 is a piece signed by Cartier. The necklace is designed as a series of graduated openwork old European and single-cut diamond swirling plaques, each centering upon collet-set old European-cut diamonds, to the old European and single-cut diamond square-shaped link backchain, mounted in platinum. The 16 in. necklace designed in 1942 has a pre-sale estimate of US$ 450,000-650,000. Highlights of pieces incorporating colored gemstones are lot 129 – A Superb Ruby and Diamond Ring – and lot 105 – An Art Deco Sapphire and Diamond Necklace by Tiffany & Co. 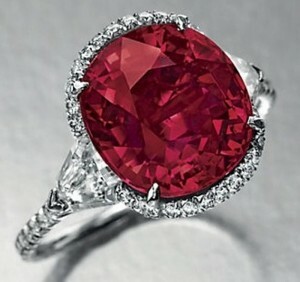 The Superb Ruby and Diamond Ring incorporates a 6.25-carat, cushion-cut, pigeon-blood Mogok ruby as its centerpiece, flanked on either side by a shield-shaped diamond, surrounded by a layer of circular-cut diamonds, the gallery and hoop of the ring also set with circular-cut diamonds mounted in white-gold. 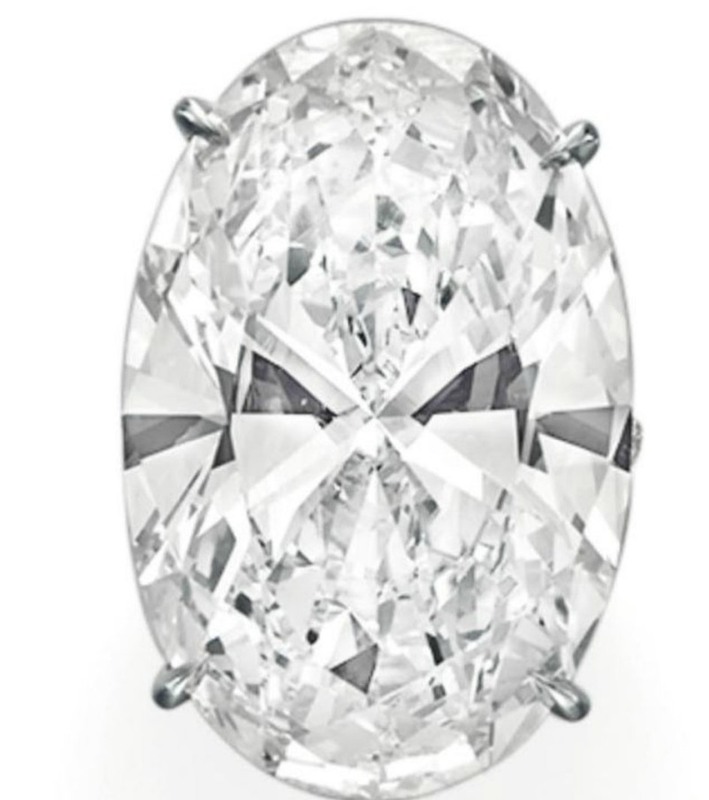 A pre-sale estimate of US$ 1.0-1.5 million is placed on this ring. 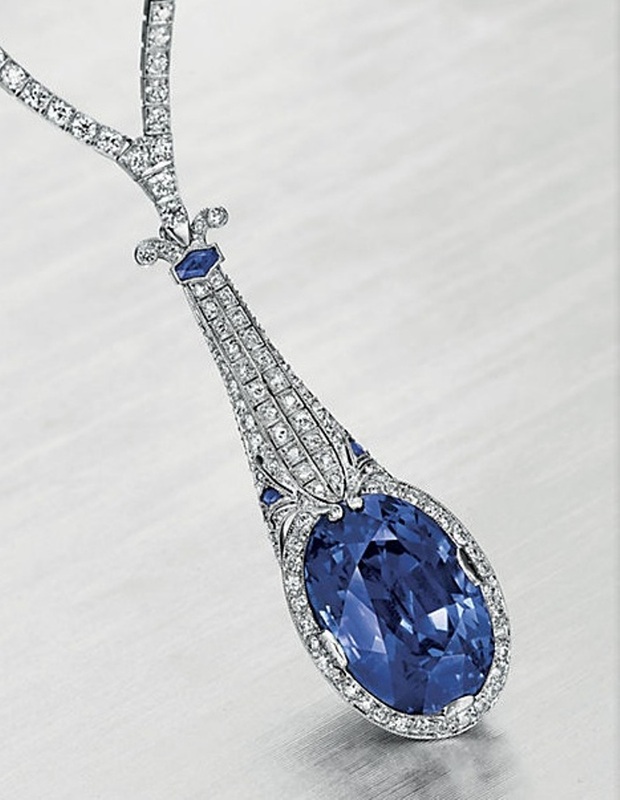 The Art Deco Sapphire and Diamond Necklace designed by Tiffany around 1920 has a detachable club-shaped pendant whose oval-shaped distal end incorporates a 29.59-carat, oval-cut blue sapphire from Sri Lanka (Ceylon) within a circular-cut diamond surround and the tapering proximal end set with circular-cut diamonds, mounted in platinum. 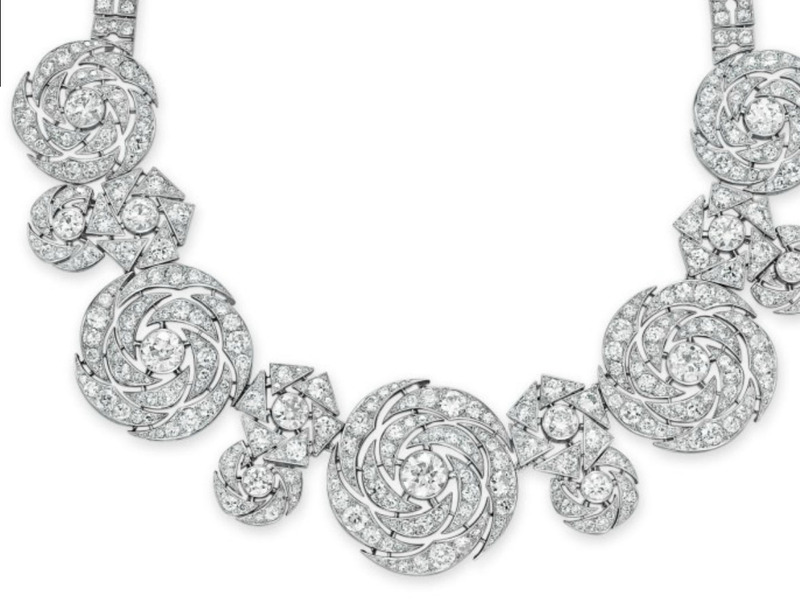 Segments of the platinum neckchain are also mounted with circular-cut diamonds.